Flowers: Family of Five. : It's a Niece! For those of you that don't know, Patrick's Aunt Katie and Uncle Brandon are expecting a baby at the end of the year and they found out last week that it's going to be a baby girl! We've been really excited about Katie and Brandon having a baby since they told us at Easter. They're going to be amazing parents and it'll be so cool to watch them with their little one. Last week when Katie and Brandon found out they were having a girl they called with the news and told us that Patrick needs to start brushing up on his Big Brothering skills since Baby Bean won't have an older brother. Something tells me between Brandon as a Dad and all of Baby Bean's uncles and Grandpas, she'll be covered. But, I told them I'd see what I could do to start instilling the "chivalrous" trait in Patrick now. 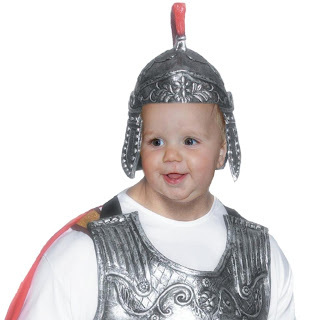 I Googled "how to make a baby chivalrous." Sadly, my efforts were fruitless - thanks for nothin' Internet! So like any good father and future uncle, I'm improvising based on what my idea of chivalrous is. Sadly, they don't make real swords for babies and apparently dragons don't actually exist despite the myriad books I read on the subject when I was little. So instead I started Patrick on a strict regimen of lifting all his heaviest toys and carrying them around the room. And he's chasing Roxy all over the place now, which should help with his speed. I'd also like to teach him to say "my lady" with an English accent. By the time Baby Bean is born, Patrick will be a mean, lean, Big Brother machine - or a happy, chubby, cousin playmate that keeps calling everyone "my lady"...but whatever. Congratulations to Katie and Brandon again. We're very very excited for you guys and can't wait to meet your daughter. And best of all, it's just in time for Christmas so we get to buy her all kinds of great stuff! Oh my gosh--that last picture is GREAT! And thanks guys! We're so thankful our little girl will have such a great role model as a cousin(and that we have such great role models for parenting). Whether chivalrous or silly, we know Patrick will be an amazing buddy to Baby Bean. Bwahaha! That picture is great. Congrats to Brandon and Katie!